Williams was handed three code violations - and docked a point and then a game - in her 6-2, 6-4 loss to Naomi Osaka. 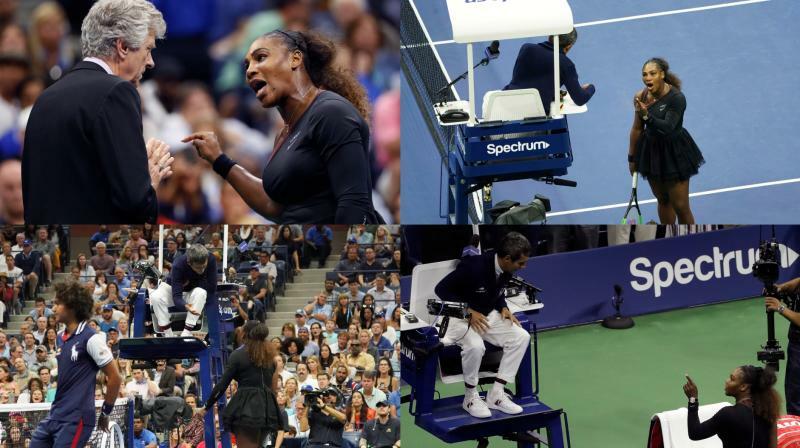 New York: Serena Williams has been fined $17,000 by the US Tennis Association in the wake her outburst during a controversial US Open final loss to Japan's Naomi Osaka. The American star was fined for coaching, racquet abuse and for verbal abuse when she accused umpire Carlos Ramos of being "a thief" during Saturday's stormy final. That violation carried a $4,000 fine, while a second violation for racquet abuse -- after she smashed her racquet after dropping her serve in the fifth game of the second set -- cost her $3,000. Serena's claim that the code violations that sparked her meltdown in the US Open final were sexist stirred debate, with WTA Tour chief executive Steve Simon backing her on Sunday.